I realize this is a shibboleth among educators today, but I’m going here anyway: recent studies have shown that there is no valid scientific evidence to show that particular students (of any nature) learn better through either an auditory, visual, or a kinesthetic approach. In other words, there are no individual learning modes. As someone who has spent quite a bit of time learning about and teaching special needs students, I do realize that the “received wisdom” in today’s educational community directly contradicts this assertion. I have always quietly questioned the “learning styles” approach for several reasons. First–and this is purely anecdotal–I have never personally observed any remarkable improvement in a student I have taught due to using lessons which were based on how that student’s learning style had been assessed, even when I was working in special education, applying these lessons diligently. Second, as a devotee of the Mae Carden philosophy of education (in addition to having attended a Carden school as a child and having received training in the method as an adult), I have absorbed her pedagogy: all students should learn through multiple senses: “reading, listening, speaking, and writing,” as Miss Carden put it. In other words, we develop our intellects by using our various God-given senses. Mae Carden also emphasized individualized learning. By this she did not mean developing an entire new curriculum for each student, but rather, the teacher’s taking the time to work individually with each student. Miss Carden trusted the good teacher to work at finding ways to connect with students. ( I was acquainted with her personally, and know this to be true.) She knew that a teacher who cares about her students will be given the ability to help them when she makes the effort. This is why it is important to keep class sizes small: most classical educators’ experience is that a class which has more than 15 or 16 students is not going to meet the individual needs of students. The teacher simply cannot “divide herself up” during the class period so as to meet the particular questions of students, if the class is large. My experiences teaching larger classes live online for the past 8 years have borne out this belief. Because my own five children are grown, and because my husband is a surgeon who works long hours, I have had the time to work very long hours in order to give my many online students the individual attention they deserve, through email and phone conversations. However, larger classes are not good, even when the teacher is willing (and able) to give this kind of time commitment, because some students “slip through the cracks” during the class period, and do not learn to interact and grow intellectually through the class discussions. Because I now run my own school, I am able to restrict the class sizes appropriately. Finally, from a broad philosophical view, the idea that we use multiple senses makes sense, because we all are human beings. That may sound simplistic, but if you think about it, it’s perfectly logical. When teachers engage students by bringing multiple senses to bear, they are teaching the “whole child.” We are whole people, not fractured beings, artificially segmented into disparate parts. It’s not possible to separate out our thoughts and inclinations into neat categories, although it certainly is a temptation! The assertion I am presenting here, while backed up with solid studies, is not popular. The government has learned how to usurp our tax money from us in ways that supposedly help our children who struggle with the accepted public school modes of learning. Other “individualistic” pedagogies popular in the homeschool movement have latched onto the “learning modes” philosophy; finally, well-meaning parents who want to find ways to understand their own children’s struggles have claimed this explanation because they have been duped. Nothing replaces individual interaction with a dedicated teacher/mentor. In the ancient classical world, those lucky few who were educated had tutors who guided them into learning with personalized attention. For the past century or so, “educators” since John Dewey have been trying to find a magic bullet which will replace this traditional approach. The result has been a disastrous experiment which has damaged our children and our society beyond measure. Unfortunately, many so-called “classical educators” participate in this experiment, either unwittingly or wittingly. There is no replacement, no magic bullet. There is only the difficult but rewarding work of learning how to learn. As I begin my own live online school, Year of Our Lord 2017, many thoughts come to mind. My involvement in the resurgence of classical education over recent decades has taught me much, both about education and about human nature. And over the past eight years, I was privileged to have been an instructor in two popular online schools, and what a rich education that has been! Primarily, a cynicism I had developed about American families through my previous teaching experiences–in particular regarding religious and (fellow) homeschoolers, has been replaced by a sense of hope about the future of America and her upcoming generations. Through the hundreds of students and parents I have “met” through teaching live online, I have discovered that there is a deep hunger for genuine learning, framed specifically by the historical Judaeo-Christian tradition which affirms that there IS such a thing as Truth with a capital “T”– that while many in our society wander in the wilderness seeking without finding, truth is, so to speak, in their backyard, if they care to dig it up. Teachers who want to communicate truth have a heavy burden, for several reasons. First, many of us have had to go back and learn what it means to hold a classical worldview before we can teach it, for we were born at the beginning of our present dark age. Second, although there have been some significant books written about how to re-appropriate the classical canon, we still need to suss this out for ourselves: How do we transmit what it means to be classically educated in this society? As with apophatic theology, which is the defining of God by what he is not, genuine learning might best be described, firstly, by what it is not: it is not a checklist of books, and it is not a codification of learning “methods,” and it is not the memorization of facts. Another apophatic assertion: if you are listening to videos as a replacement for humanities courses, you are not engaging in that conversation, because just covering the “facts” of the western canon doesn’t teach you how to think; videos have their place, judiciously used, in the classroom, but recorded courses cannot duplicate the experience of interacting, debating, questioning, and growing that occurs among students. The “great conversation” cannot be conducted without live people who engage within the Socratic environment. If you are attempting to become an independent thinker, recordings of this sort will not help, no matter how many so-called “classical” schools market them as a learning tool. What they really are is a way for greedy school owners to make a lot of money without having to pay to engage real teachers in classrooms in real time, with human students, while dealing with all of the attendant problems that come with negotiating with embodied people, not “virtual” life. Schools which provide such videos in place of genuine learning should, at the very least, delete the word “classical” from their marketing and their vocabulary. Let us strive, on our classical journey, to be honest with ourselves and be sure that we do not take shortcuts which are, in fact, wanderings in the educational wilderness. Forever may you climb in silver splendor. Is where I sometimes exist. I welcome that which is beatified~ even the shadows. Locked in the Loo at Paddington Station, or How I Beat the British Bathroom Bureaucrats, c. 2011 A.D. Summertime. I go to the loo, which is underground, and has 8 or 10 cubicles in it. I shut the door to the cubicle, sliding the metal bar through the hardware on the frame next to the door. When I subsequently try to open it, it won’t budge, because the bar has lost its moorings and has jammed, unable to center itself enough to be pulled out. I try adjusting it, attempting to keep it centered with a fingernail file, but– no go. Then I decide I will have to crawl under the door, and I look down, but there is a clearance of only about 4-5 inches between the door and the floor. I’ve recently lost some weight—but not that much! Then I think of crawling over the wall to the next cubicle, but the walls are so very tall that this would be a challenge—though perhaps not an impossibility, if there were no other alternative: Maybe I could somehow rig my backpack up on the door as a way to pull myself up, using the slanted toilet paper holder as a foothold? Before trying this, though, I call out and ask the (very nice but completely flummoxed) Pakistani attendant to help me. I tell her that I need a screwdriver, because I can see that I could take the simple latch off in a jiffy, if I had one. She does not feel that she has the authority to do this–or perhaps she does not know the word screwdriver in English—I’m not sure. . . so she calls a (male) supervisor in. He comes, but has no screwdriver with him. Apparently he does not know what to do, although by this time I am calling out frantically and repeatedly, “Just get me a screwdriver!” The Pakistani attendant tells me they are, but by now, 15 minutes have gone by, and I’m beginning to worry. I try calling John but the phone won’t connect, as the loo is underground. So, I breathe a prayer and text him…this works. I tell him my situation, and he texts back how funny it is that we have the technology to text each other but they can’t get me a screwdriver. Yeah, hilarious-a real belly laugh. I keep banging on the door, demanding a screwdriver, exaggerating my upset emotional state. The woman in the stall next to me says, “Calm down!” I say, “Don’t tell me to calm down!” YOU calm down!” I feel that the time for reasoned, measured discussion is over. Next, the attendant and the supervisor call ANOTHER (male) supervisor. I continue to aggressively pound on the door, while sticking my foot on the bottom, rattling it in an annoying manner, so people will notice me, and calling out, “I JUST need a screwdriver and I can be out of here in less than a minute!” A second supervisor comes, but I don’t know this—the attendant continues to tell me that they are getting a screwdriver, which is not actually the case. Unbeknownst to me, they are simply standing there, gawking at the broken cubicle, doing nothing. John texts me again, “Do you need me to do something?” I text back that I may, but I will wait a couple of more minutes, since I am foolishly believing the attendant’s false promises. My annoying pounding and yelling continues for a total of a half an hour, perhaps longer. Finally, just as I am ready to tell John to come on down (and he would have), the hand of a fellow traveler appears under the door and offers me a Swiss Army knife with the screwdriver attachment open. I grab it and in 30 seconds or less have taken off the offending latch. The kindly Pakistani attendant is standing on the other side of the door, saying, “Something will have to be done on this side, also, for you to get out,” but I open the door, and simply and shakily step to freedom. I hand the Swiss Army knife back to the clever and helpful woman who loaned it to me, thanking her, and assuring the apologetic attendant that it’s ok. As I look up towards the door, I see two males in uniforms standing there, staring at me—the supervisors, who clearly are NOT Pakistani and do speak English. I glare at them and pointedly declare, in a stentorian tone, “Don’t you know what a screwdriver is?” two times, and stomp up the stairs, relieved to be surrounded by the blessed cacophony of Paddington Station. 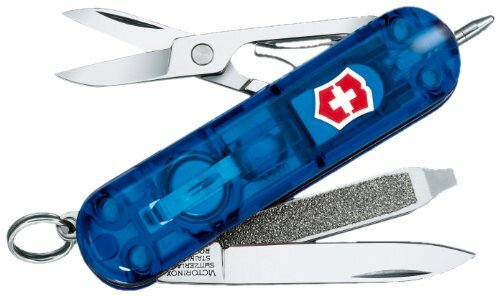 The first thing I’m doing when we return home is buying a Swiss Army knife, which will permanently reside in my purse. I’m still deciding what color I want; (John’s is red, so I’ll choose something different) and what features to include, but the screwdriver attachment is NOT optional. I can’t imagine how I’ve survived without it all these years.